When inquiring into aspects of truth and reality, there are limits to the degree of verification we can employ to trace something back to its roots in the grounding of reality. You can only regress back so far to trace something and know it as a valid truth. These root foundations of understanding are called axioms. You can’t infinitely regress forever to try to prove everything based on something else. At some point to reach the ground, an axiom of self-evident truth. Axioms are self-evident propositions and principles that cannot be further reduced to be proven valid. They become points of authority for understanding reality. These are foundational starting points that are required to build higher order comprehension about reality. We then build up from this axiomatic grounding in reality to construct larger conceptual frameworks, infrastructures and models. Axioms are supposed to be rooted in reality to give us firm grounding in truth and have our perceptions and conceptions aligned with reality, but that does not always happen. Existence and consciousness are the basic two axioms to start from. We exist, things exist, and we are aware that things exist, and are aware that we exist. To be consciously aware (verb) of something (noun), requires something to exist for us to be aware of it. A verb requires a noun first. First comes the noun, existent things in existence, then comes the verb, awareness of those existents. First comes existence, then comes consciousness that can possibly be aware of existence. This is the first axiom, the principle of the Primacy of Existence. To think otherwise, and imagine consciousness has primacy, is a fallacy, irrational, and objectively unprovable. The etymology of consciousness is: con “with” + scio “knowledge” +ness “action, quality or state”. Consciousness is being with knowledge of recognizing one thing from another (the Law of Identity). Consciousness is a quality and faculty which perceives and identifies existents. Consciousness is conscious of something that exists. You can’t have consciousness to acquire knowledge of things in existence without first existence. You can’t have awareness that consciousness exists without existence existing. An actions, quality, state or faculty can’t operate and not exist at the same time, therefore consciousness must exist for consciousness to function at all, and existence itself is a prerequisite for consciousness to exist within it. Hence the Primacy of Existence axiom, which places consciousness as secondary. Existence etymologically means to “stand forth, come out, emerge; appear, be visible, come to light; arise, be produced; turn into”. Existence sets up, places, sets down, makes firm, sets forth and causes to stand forth the extant objects within its framework, model and structure. Existence is reality. Existence is what ‘is’. For you to talk about anything presupposes the necessity of existence. For you to talk about anything also presupposes the necessity of the existence of consciousness, yourself, which identifies that which exists, that which ‘is’. Existence is that which ‘is’. Synonyms for existence are reality and truth. Another synonym for reality and existence, is the universe which means “turned into one” because we group all of the variability, diversity and multiplicity into one universal concept called the universe, existence, reality, or the universal concept of “truth” itself. These terms are essentially interchangeable. Existence and consciousness are the first two basic observational points to start building knowledge from. These two foundational axiomatic points can always be used for grounding in objective reality to derive greater understanding in all our conceptual frameworks. All other thoughts that do not lead back to these foundational axioms, can likely be regarded as pure imagination and fantasy ungrounded belief. From these two foundational axioms, we can learn more about the objective universe, existence, reality and our world. We can also learn more about consciousness, our subjective “multiverse”, inner-existence, inner-reality and inner-world of experience, and not confuse the two or which comes first in the primacy of epistemological knowledge and understanding. We can proceed to understand various aspects, attributes, properties, characteristics and qualities of truth, of existence and reality. We can progress to understand morality, Moral Truth/Law, objectively, and not fall into the deluded trap of “moral relativism”. The Power of Consciousness can be developed, to evolve and derive greater comprehension of reality and truths therein. Morality is directly and inextricably linked to the term consciousness. 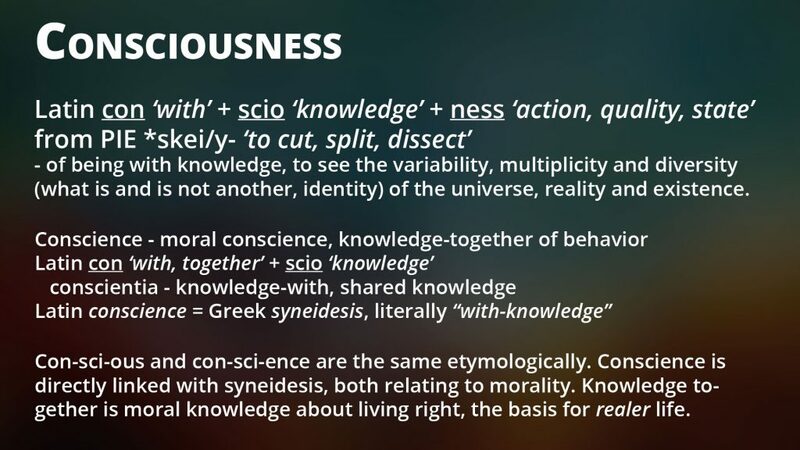 Morality can be understood in greater degrees through the etymology of consciousness and conscience, our moral comprehension faculty for behavior and actions, and related derivations such as syneidesis and synderesis. Philosophical understanding is directly related to psychological-psyche-mind-consciousness processing of information about reality. This is what the Trivium Methodology is for, to learn how to learn and how to think more effectively. Stay tuned for more on these subjects in the future, to lay a foundation of verifiable grounded understanding in reality.